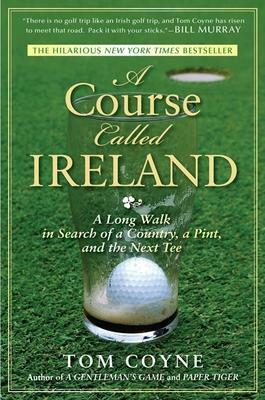 By turns hilarious and poetic, "A Course Called Ireland" is a magnificent tour of a vibrant land and paean to the world's greatest game in the tradition of Bill Bryson's "A Walk in the Woods". In his thirties, married, and staring down impending fatherhood, Tom Coyne was familiar with the last refuge of the adult male: the golfing trip. Intent on designing a golf trip to end all others, Coyne looked to Ireland, the place where his father has taught him to love the game years before. As he studied a map of the island and plotted his itinerary, it dawned on Coyne that Ireland was ringed with golf holes. The country began to look like one giant round of golf, so Coyne packed up his clubs and set off to play all of it-on foot. "A Course Called Ireland" is the story of a walking-averse golfer who treks his way around an entire country, spending sixteen weeks playing every seaside hole in Ireland. Along the way, he searches out his family's roots, discovers that a once-poor country has been transformed by an economic boom, and finds that the only thing tougher to escape than Irish sand traps are Irish pubs. "Equal parts touching, wry, and hilarious." "There is no golf trip like an Irish golf trip, and Tom Coyne has risen to meet that road. I look forward to reading this again. Pack it with your sticks." "Witty and winning...A joy from start to finish." "Like the country itself, Coyne's book is an affable ramble through a charmed land." "A Course Called Ireland explores the history of the land being traveled and pauses for tales both tall and short, as well as, in this case, for pub songs. Coyne finds plenty of all of the above from Kilkee to Kerry, the long way. Golfers reading this book may wish they'd been walking by Coyne's side." "A delightful and fun book." Tom Coyne is the author of the novel A Gentleman's Game and cowriter of the screenplay for the novel's film version, which starred Dylan Baker and Gary Sinise. He is a contributor to Golf Magazine and teaches creative writing at St. Joseph's University.